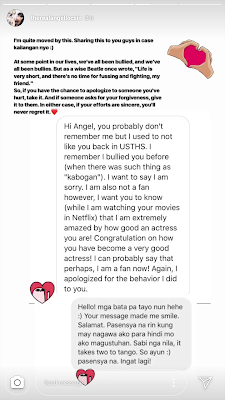 Happy that ms angel remains humble khit sikat ..
Grabe ang appeal ng Kasikatan at Karangyaan nagiging repentant at gustong makipagclose pati mga umaway syo dati! di ba may cover yung name ng nag message. private pa rin. I guess she asked for her classmate's permission before posting. Very timely for her to share "bullying" issues. And sense of forgiveness and moving on. Be happy, always. Hey bitter, if you read what she said in the upper part "in case kailangan niyo" she's sharing it to impart an important life lesson which I guess you missed or ignored. Also, the person in the dm was not named. Stop being so NEGA & look for the positive. And if ever she's papansin as you claimed, you obviously made pansin and effort but sadly took the bitter pill. 12:50 malapit na semana santa. 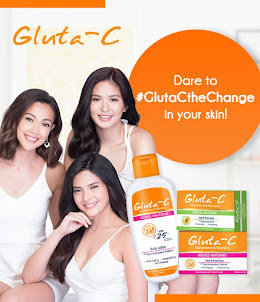 pahinga muna sa pagiging hater/basher. 12:50, di mo naman kelang isigaw sa amin na private message yun. 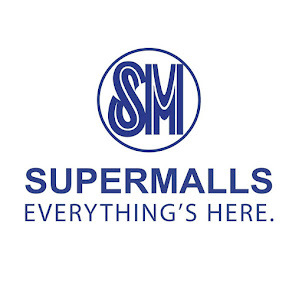 Nakakabasa naman kami. Papansin nga, para mapansin na ang isang bully pwede magbago at ang nabully, kelangan magpatawad. Bullying din ang dating mo sa akin, 12:50 pero sige iintindihin na lang kita but I need to point out to you kung saan ka off. Sana balang araw makapag sorry ka din kay angel. Ikaw kaya papansin baks, ang pakla mo masyado. AnonymousMarch 30, 2019 at 12:50 AM hiningi po ni angel ung permiso ko bago nya pinost yan. ok na? OMG! Friend of Angel. I am also a fan of yours after reading your message to her. It takes courage to ask for forgiveness especially if you were the one who was bullying her way back then. And yes, don't mind those keyboard warriors... as if they know everything. Nonetheless, I wish you well. It feels so nice to be vindicated and appreciated by the people who previously hate you for no reasons.. Ganun din ako dati eh.. lots of people will say, "akala ko suplada or maldita ka, yun pala eh mabait at nakakatuwa ka kasama." This is so heartwarming. And Angel was right we were all bullied and we were also bullies one time or another. In my case, after watching 13 reasons why na bother ako talaga. I was so affected that I carefully thought back if there were people I might have hurt in the past and then I reached out to that person and sincerely apologized out of the blue. She was so touched too, forgave me, and she also apologized to me. What a feeling after. I like that Angel encourages this by posting. Hope a lot more lives are touched by kindness. 2:16 May mga kinakastigo siya don't worry. Pero di niya naman nabantayan 24/7. At least she's doing her part at di niya tolerate once napansin niya. Pinagyabang 2:16? 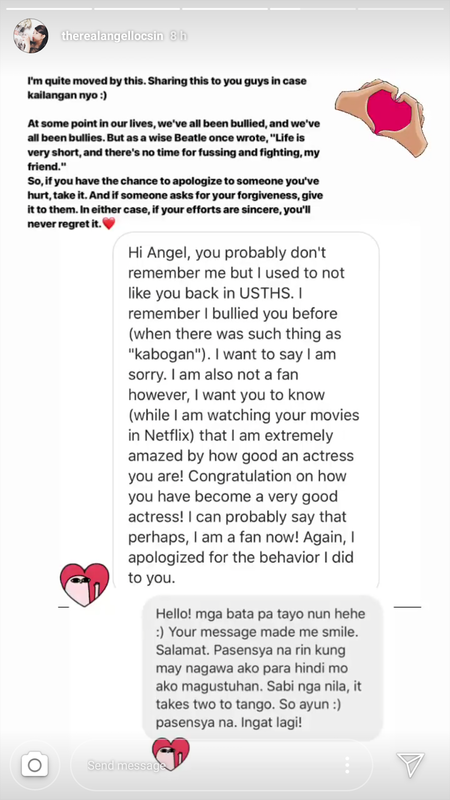 Only a hater would think that way.It's a great, positive, helpful message she wanted to put across - and it gives you that realization na 'ay, maybe it's time to truly forgive' or that 'tides can turn, and people can change' - something like that. Pero siempre pag hater ka talaga, negatibo lang din ang makukuha mo. So good luck na lang sayo. fishing for praises na naman si ateng Angel. di ba nag trending ang pasa posts kaya hanap na naman ng pwede i-trending? Nega mo masyado. Atleast nga goodvibes mga post niya. ah e nagtrending po ang pasa pictures nya by the way 100k plus ang likes at thousand shares. ok na po? I don't see anything wrong specially if it's something to be proud of. Suportahan mo na lang naghihingalong movie ng idol mo. 2:30 am eh ano tawag mo sa ibang artista na kung ano-ano na lang ang posts? 2.30 I'm so sorry if you're blinded by "gusto ng likes, pasikat, pa goody goody" type of posts. Angel's post is so timely to remind us that at some point in our life, may na bully at nambully sa atin or someone close to us. Bullying is a serious matter. Words can make or break people. It leaves us skin deep scar. It comes to a point that people take their lives because of bullying. Think about it. She is inspiring positivity. You on the other hand would rather see it in a bad light. Sad. As someone who went through school bullying, nakakagaan ng puso yung nagkapatawaran na sila. Glad to know pero sana magsorry din sya sa lahat ng binully nya noon, sumikat man o hindi. Ang ayos ng buhay ng mga bullies ngayon samantalang yung victims nila eh scarred for life. Asan ang hustisya diba? Nag message din sa akin ang dating nambully sa akin sa school. Date daw kami. Ni-reject and block ko siya. Love this type of ig. May sense and hearfelt kesa sa puro mukha na fishing for compliments how beautiful (with the help of photoshop) the owner of the acct is. Maniniwala na sana ako kaya lang puro tungkol sa acting ang sinabi nung former bully. Parang something is off.